Yes, it's that time of the year again – We're taking on the banana benders; we're less than an hour away from kick-off of the first of three State Of Origin games. It's true that many see the experienced QLD side as favorites, but there are those who say the rejuvenated NSW side has what it takes to break the 3 year losing streak. Yes, we have quite a few Origin rookies in our team, but quite a few "experts" (i. e. anyone with more knowledge of the game than myself, and that's pretty much everybody) agree that it's a team that can score points; and last time I checked, that was the way games are won. 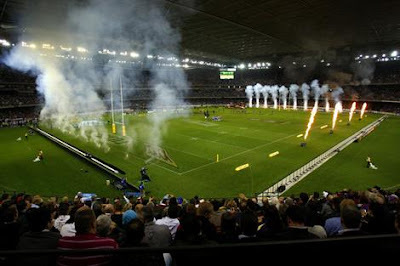 So I'm confident for tonight's game; and when Origin 2 comes to Sydney in 3 weeks' time, things will look even better. From a slightly geekier perspective; I'm also looking forward to seeing my first State Of Origin game in Hi Def TV, after recently upgrading some of my electronics stuff.